Well, we've really got to talk about this big one next week, the new James Bond film Spectre. It is out on Monday, October 26th. It is a spy exciting espionage extortion extravaganza. That is easy for you to say. Don't you mean: Spectre - cular. It is certificate 12A, so we're old enough to be able to see that then on our own. However, some people are saying that the film is too violent for a 12A, with shocking scenes of torture and eye gouging. 'James Bond returns for his latest globe-trotting adventure'. For those interested in the plot, it is about Bond getting a cryptic message that leads him onto the sinister organisation named 'Spectre' It has a new M (not Mary Berry in this one) and stars Daniel Craig, Ralph Fiennes and Naomie Harrie. And do you know what Spectre actually stands for. And it is the 24th Bond movie so far, and probably Daniel Craig's last, as he's fed up with doing it. So, do you like a bit of Bond, James Bond? Do you have a favourite? My mum likes Sean Connery. 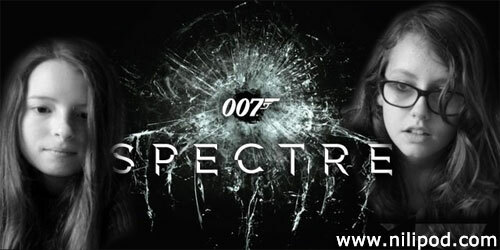 And everyone is asking the question, what is the actual logo of Spectre meant to be. Is it a spider, is it an octopus, an alien, or is it actually us playing a crazy game of twister - two legs, two arms, two legs and two arms. Who knows? We'll leave it up to you to decide, but we did have fun posing for it, didn't we? !.